his best game on Saturday. Under 6 Red defeated Brighton at Brighton on Friday night. 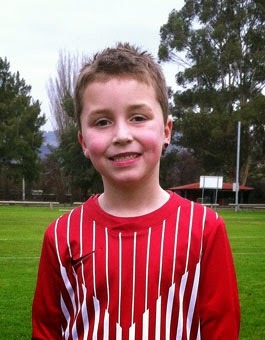 Well done and thank you to Hemi for helping us out and scoring three goals. Another goal was scored by Jake and there was great teamwork from Noah and Anna. Under 6 Black defeated Moonah Primary, with good captaincy from James, good sportsmanship from Zack, and a good effort by Lucas, Vincent and Lewis. Goal kickers were Hemi 3 and Shaun 2. Well done boys. 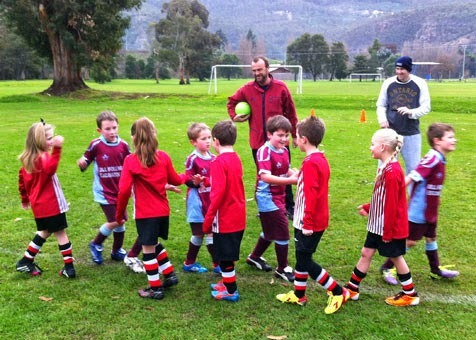 Under 7 Red defeated Moonah Primary with a super effort showing great teamwork. A special mention to Joel for scoring his first goal! Under 7 Black played Holy Rosary and a fantastic effort was made by both teams. It was such an enjoyable game for the kids. A special mention to Rodney Browning on playing one of his best games yet. The team continues to improve every week. Keep up the awesome work guys. after their great game at Tynwald Park on Saturday. Under 8 Red played a great game against Dominic Maroon and the rain didn't stop them. Thank you to subs Mikayla and Astrid who showed some fantastic kicking. A great team effort everyone! Our goalie was Jacob White and the goal scorers were J'Khobi and Jack. Under 8 Black tried hard against a very excited Dominic side. Well done to Mikayla for her hard work in the goals in the second half and thanks to Jack for subbing for us once again. Unfortunately Joshua hurt his leg in the second half and was unable to finish the game. Caitlin, Mia, Astrid, Jacob J and Jess B tried their best with Mikayla and Astrid going on to sub for the Red team in the next game. Under 9 had a great game against Brighton. Well done to Cruez and Caleb for their goals, and Ella and Luke for some awesome goalie work. Thanks to Tanesha for filling in. Under 10 took on Dominic Yellow and won 4-2. Our goalies Alex Mc and Alex G did a fantastic job; our defence of Brock, Ostyn and Alex B were amazing and well backed up by Kiara and Luke through the middle. Maddy kicked the first two goals in the first half and she was well backed up in the second half with Jacob and Aidan kicking a goal each. It was the fastest game for the season and everyone played brilliantly. Well done team, very proud of you all! Under 11 had another great win with the entire team playing their part. Well done all. Under 14 – match cancelled. Under 16 played Huon, going down 5-1 after playing what seemed like the longest game in history! New Norfolk was well supported by many Under 14s who made the trip to Huonville to assist. New Norfolk’s goal came from Brayden. Seniors Division 4 – match cancelled. Tynwald Park on Saturday morning.